Last week, we saw that a U.S. trained Tajikistan special forces colonel had defected to ISIS. Today, reports emerged that two-time Muay Thai world champion Valdet Gashi has joined ISIS, along with some of his students. If ISIS really has nothing to do with Islam, why are so many Muslims, from so many countries and so many backgrounds, misunderstanding Islam in exactly the same way? RT—A 29-year-old German kickboxer and two-time Muay Thai world champion of Albanian origin, Valdet Gashi, has joined ISIS and left for Syria to fight for the Islamists, Swiss media reports. According to the Swiss SRF (Schweizer Radio und Fernsehen) program Rundschau, Gashi joined ISIS in early January 2015 but he had been concealing his whereabouts for several months, so that his family believed he was in Thailand. SRF journalists managed to reach him via telephone in mid-May. During a 90-minute telephone conversation, Gashi reportedly told journalists that he had a deep and profound understanding of the ISIS ideology and had gotten used to ISIS’s ideas by now. “I want to do something good and to die while doing it. That is what would make me happy,” he said. He also asked his friends and family not to denounce his decision as “they did not know the whole story,” he Switzerland’s 20 Minuten news. In Syria, Gashi is taking part in the establishment of a Caliphate, the SRF news network reports. In particular, he patrols an area along a stretch of the Euphrates tracking down smugglers and spies. He operates primarily near the city of Membij, close to the Turkish border. 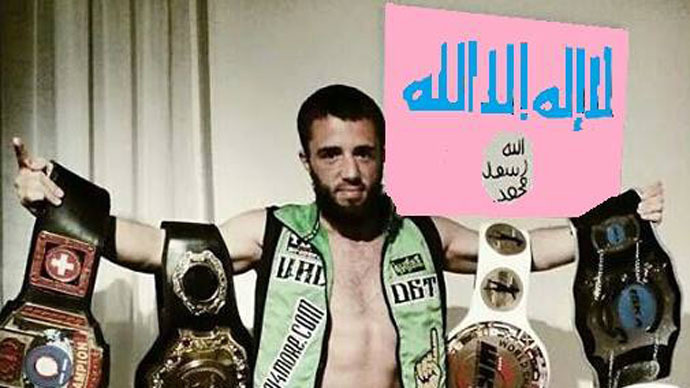 Some muay thai fans responded to the news about Valdet Gashi joining ISIS by a proposal to deprive him of all his sport titles. However, it is reported that he had not immediately left for Syria after joining ISIS. Initially, he came to the Swiss town of Winterthur, where he established a sports school named MMA (Mixed Martial Arts) Sunna. I just love you brother!! Also, can't wait for that day when we can see, "Prominent Muslim LEAVES Islamic State". I'm not sure if you're joking, but I assumed his face is deliberately blurred to protect his identity. I would suspect that the only way for a prominent Muslim to leave the Islamic State alive would be through a divine act of intervention such as Paul and Silas experienced. There are many, many things the news does not report, nor should they if it puts people lives at risk (which they so often do). The fact that we do not read about Muslims leaving however, does not mean that it does not happen. God makes a way where there is none! I have to assume the censorship was before he left for ISIS, though, because he's dead now, so there's nothing there to protect anymore. Anyway, I remember seeing on the news several months ago that people who'd come from abroad to join ISIS were feeling homesick and reaching out to others through social media, wanting to go home. I can only hope that's still happening. I bet plenty of those people still haven't committed atrocities, so there's time for them to turn around (even if they're killed on the way out). Oh, I see what you mean. Yes, it is odd. That's so true what you say about there being time. The story of Samson tells us that we can make wrong choices and God will always be faithful to provide us with a way out, even if that means the way passes through the valley of the shadow of death. When suicide bombers fail in their mission and end up killing no-one but themselves, I often hope this is because they took hold of God's outstretched hand and God simply took them home. And honestly, I'd rather die trying to do the right thing than not do the right thing at all. That's got to count for something. Firstly, thankyou David, for your awesome ministry. I'm a regular reader of your articles, though this is my first post. (Thought you might be interested in using it as the basis for a future blog post).